David Shepherd, who co-founded The Compass improvisational comedy group on the University’s campus 50 years ago, returned to campus this summer to direct students from the Off- Off Campus theater group in reviving the first show performed by The Compass. The Compass was the predecessor to The Second City, which continues today in the city of Chicago. 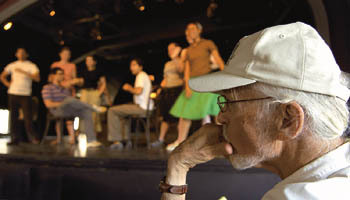 David Shepherd, directly above, watches members of the University’s Off-Off Campus rehearse for the performance, in which they would reinterpret the same skits that were performed 50 years earlier by members of The Compass. The show, which was performed in the Reynolds Club’s Francis X. Kinahan Third Floor Theater, sold out. A specific birth date and location of an art movement is rare, but contemporary improvisational comedy has both: On July 5, 1955, in a long-gone tavern once located just off campus, improvisational comedy was born. Imagine a world without The Second City or “Saturday Night Live,” a parallel universe without the talents of John Belushi, Bill Murray or Tina Fey, a modern cultural landscape without This is Spinal Tap or Monty Python’s Spamalot. These comedic institutions all took their direction from The Compass, a small group of University students and their friends who unwittingly changed the course of comedy one summer day 50 years ago. To honor the golden anniversary of the birth of improv, The Compass co-founder David Shepherd returned to the University to attend a celebration that included a performance by Off-Off Campus—University Theater’s renowned improv and sketch comedy group and a Compass progeny—as the students recreated The Compass’ first show, produced July 5, 1955. Performing this year on Tuesday, July 5, in front of a sold-out audience at the Reynolds Club’s Frances X. Kinahan Third Floor Theater, nine students riffed off headlines from that day’s Chicago Tribune, creating humorous skits in the same vein as The Compass actors did 50 years before. Third-year Dana Kroop, a History and Philosophy of Science student, read bits of stories about Russian politics and biosphere scientists as the performers joked, acted and sang the tongue-in-cheek Tribune Blues. Next came The Game of Hurt, an improvised short based on a one-page scenario written by The Compass co-founder Paul Sills in which a husband sells his wife to a steelworker he meets at a bar. Audience members then provided the plot for the rest of the show by offering random suggestions for scenes based on phrases such as “you’re too late” and settings such as a cookout for teachers at an elementary school, which Off-Off Campus members turned into skits they performed on the spot. The Compass, the predecessor to The Second City, evolved at the same time the beat scene was blossoming, challenging relatively conservative and formulaic forms of literature and art. Shepherd left his home in New York because he thought theater there was too “anemic” and geared to a limited audience. He came to Chicago in the hopes of creating a cabaret-style theater with broad mass appeal, one that would reach factory workers and shop clerks, the quintessential “everyman.” It was in Hyde Park where he met Sills, and the pair set off to put their ideas onstage. Shepherd began studying with Sills and his mother, actor, director and teacher Viola Spolin, whose depression-era work with children’s theater cultivated individual creativity. 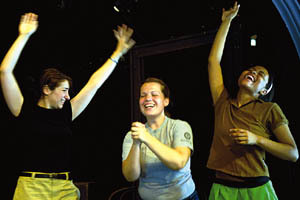 Spolin’s highly specific theater games were ultimately more than a series of acting tools: they changed comedy forever. In 1955, Sills and Shepherd adapted the games to an idea they had, partly inspired by Berthold Brecht, for a politically and socially relevant form of theater. This was The Compass. Today Off-Off Campus students use the exercises Shepherd, Sills and Spolin developed as they create their sketches, as well as those in The Second City, “Saturday Night Live,” and actors and comedians the world over. The Compass as an institution only lasted a year and a half, but that short period gave rise to contemporary improvisation, a performance art that the University and the city can proudly claim to have generated. It also helped launch many careers. The cast that first night in 1955 included Shepherd, Sills, Roger Bowen (Colonel Henry Blake in the movie MASH), Elaine May (author of films such as Primary Colors, The Birdcage and Heaven Can Wait) and Barbara Harris (Tony Award winner, Oscar nominee and an actor in such films as Nashville and Dirty Rotten Scoundrels). Though today improvisational comedy seems to be on every campus, the University still stands out. University and Off-Off Campus alumni include Pulitzer Prize-winner David Auburn, writer of the play and the forthcoming film Proof; Greg Kotis, author of the Tony Award-winning Broadway musical Urinetown; and recent Second City alumnae Abby Sher and Tami Sagher, the latter of whom is now a writer for Fox’s “MADtv.” Other notable alumni of the University’s improv community include Mike Nichols, Bernard Sahlins and Ed Asner. 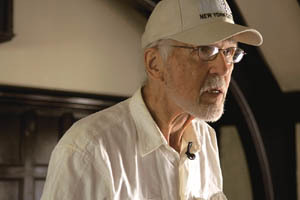 To cement the relationship between improv and the University, Shepherd donated his life’s papers to the University’s archives, housed in the Special Collections Research Center. The archives include flyers, photos, production stills, diaries, newspaper articles and audiotapes chronicling the birth of improv.